1862-1913: System of National Banks, Consequence of Lincoln's War, Jesuit controlled. 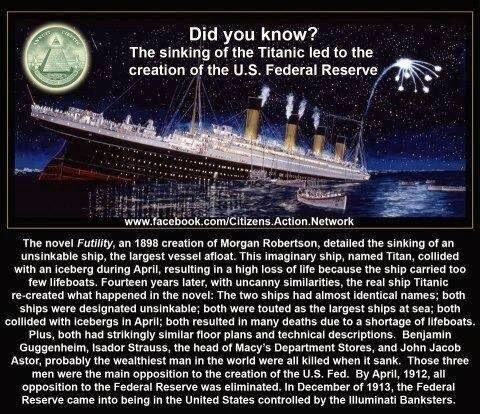 The Federal Reserve Bank is a consortium of twelve private banks which are not part of the United States Government. These private banks purchase paper notes from the U.S. mint for printing cost or simply enter digital currency into their computer then lend back the currency plus interest which do not exist to the people through member banks. The profits go into the shareholders of the bank's pocket's, the U.S. public receives no benefit. If you see this poster on the internet, it is 100% proof that is a HOAX, central banking is volatile, please educate yourself, here is an example but may need some update. All the primary owners are branches of European establishments. Foreigners, almost entirely Jewish, control the United States currency supply. They literally own exclusive rights to the dollar and simply enter dollars into their banks books to make currency which they then lend back to us at a profit. For them currency does not grow on trees, it is simply a data entry into their account. Clearly the private ownership of the U.S. Dollar is by far The Greatest Crime of the Century. The owners of this bank have been responsible for instigating all the major wars and depressions in the last 100 years in the US alone and over 450 years around the world. They own the bank, they own the dollar and they own all the major media channels, the military industrial complex and most politicians, judges and cops. not a word about his masters the Jesuits and the Knights Templars. The cost of this system to the U.S. public is hundreds of billions of dollars every year while holding the nation and people in a constant state of debt slave. The bank is supposed to bring stability to the economy, however, almost every major market crash and war can be attributed to the Federal Reserve Bank, including the Great Depression, WWI, WWII, Cold War, Korean War, Vietnam War, the Gulf War etc (click) as highlighted in our section of the Empire Endless Wars system. In the late 1960's, the "dollars for gold" system had become unsustainable as Washington insisted upon the adoption of a "welfare state" that relied upon massive entitlements and a "warfare state" that required perpetual wars. Their solution would come in the form of something known as the Petrodollar system. The three primary benefits that the Petrodollar system provides to America will be explained. In order to ensure their economic hegemony, and thereby preserve an increasing demand for the dollar, the Washington elites needed a plan. In order for this plan to succeed, it would require that the artificial dollar demand that had been lost in the wake of the Bretton-Woods collapse be replaced through some other mechanism. (1743-1812) In 1773, Rothschild, formerly Bauer, pulled together 12 other investors to join in his plan to dominate the world. On May 1, 1776 Adam Weishaupt retained by Rothschild's completed their world dominance plan. Alexander Hamilton however lobbied for the first privately owned Federal Bank. Hamilton conceded that the constitution was silent on banking, however, he asserted, that Congress had the power to tax, to borrow money, and to regulate interstate and foreign commerce and suggested that Congress could charter a private corporation to assist in carrying out these powers. In 1790 Hamilton persuaded Congress to pass the Assumption Act where the Federal Government assumed States debts. In 1791 Congress chartered the Bank of The United States. Congress passes the Coinage Act in 1792 which establishes a U.S. mint. Hamilton resigned as Secretary of the Treasury in 1793. It is reported that Hamilton was paid by the Rothschild family for this service. In 1811 Congress Refused to renew the charter for the Bank of the United States & the bank is closed. 1812-1815 War breaks out with Britain. In 1836 The Bank of the United States charter expired. Congressional Bills to establish a new national bank were twice vetoed by President Tyler in 1841. In 1846 The Independent Treasury Act is approved. Following Lincoln's assassin-nation, Andrew Johnson, whom many have shown was involved in the assassination, became President. On December 18, 1865, a new Thirteenth Amendment was ratified ignoring the existing properly ratified 13th Amendment which eliminated citizenship of persons who swore allegiance to other Nations or secret societies. (On July 27, 1866, the Second Atlantic cable was completed). President James A. Garfield was inaugu-rated in 1881, he said "Whoever controls the volume of money in any country is absolute master of all industry and commerce". On July 2, 1881 Garfield was shot, he dies on September 19. In exchange for financial support for his presidential campaign, Woodrow Wilson's agreed that if elected, he would sign the Federal Reserve Act. In December 1913, while many members of Congress were home for Christmas, the Federal Reserve Act was rammed through Congress and signed by President Wilson. Regarding his actions Wilson later admitted. "I have unwittingly ruined my country". The Fed became law the day before Christmas Eve, in the year 1913, and shortly afterwards, the German International bankers, Kuhn, Loeb and Co. sent one of their partners here to run it. The un-ratified 16th Amendment The Constitution only allowed direct apportioned taxation amongst the States, so indirect Income Tax was initiated through the 16th Amendment so as to allow Congress to pay the bankers interest on our money and for any other whim. The 16th Amendment was pushed through without proper ratification in February of 1913. The Fed allows Congress to spend all they want that's why your Congressperson does nothing. "Mr. Chairman, we have in this Country one of the most corrupt institutions the world has ever known. I refer to the Federal Reserve Board and the Federal Reserve Banks, hereinafter called the Fed. The Fed has cheated the Government of these United States and the people of the United States out of enough money to pay the Nation's debt. The depredations and iniquities of the Fed has cost enough money to pay the National debt several times over. .... This evil institution has impoverished and ruined the people of these United States, has bankrupted itself, and has practically bankrupted our Government. It has done this through the defects of the law under which it operates, through the maladministration of that law by the Fed and through the corrupt practices of the moneyed vultures who control it. " - Congressman McFadden on the Federal Reserve Corporation Remarks in Congress, 1934 Floor of the House of Representatives by the Honorable Louis T. McFadden of Pennsylvania. Mr. McFadden served as Chairman of the Banking and Currency Committee for more than 10 years. There were two assassination attempts against McFadden. "Who controls money controls the word”. – Henry Kissinger Counsel on Foreign Relations Ron Paul introduces bill to eliminate Federal Reserve Bank: see GovTrack.us. H.R. 2755--110th Congress (2007): To abolish the Board of Governors of the Federal Reserve System and the Federal reserve. 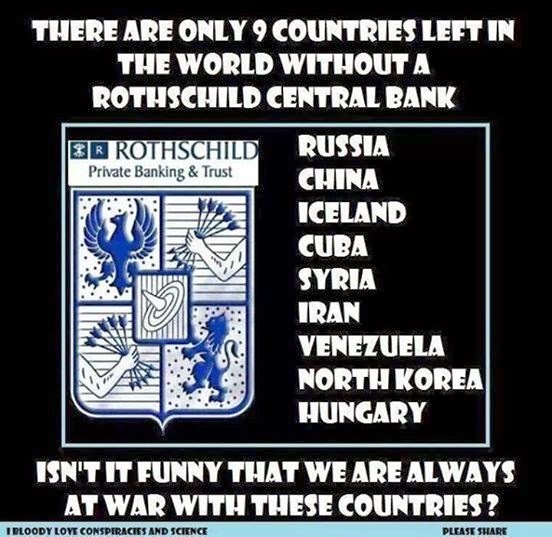 The Rothschilds are majority owners of BP and Royal Dutch/Shell, as well as the Bank of England, the Federal Reserve and the Saudi central bank – Saudi Arabian Monetary Agency (SAMA).